Dog Gets Stabbed In The Head While Saving Its Owner, Survives! 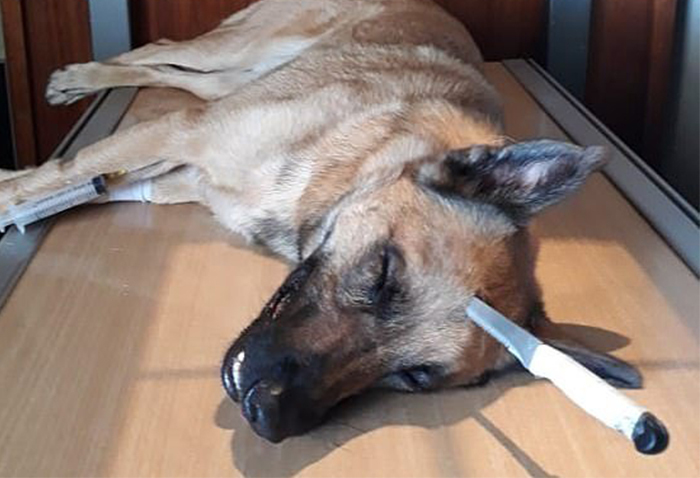 Heroic Dog Gets Stabbed In The Head While Saving Its Owner From Being Robbed, Miraculously Survives! Disclaimer: Story contains images which may appear distressing to some. Viewer discretion is advised. Dogs are probably the only creatures in this world, who love you unconditionally. Apart from being just loyal, they will also protect you with all their might if need be. And of course, we have come across numerous examples of the same over the years, which prove our point. And today, we are going to share a similar incident of fortitude and faithfulness, where a German Shepherd saved his owner from getting robbed, while getting almost killed. According to Mail Online, the incident took place in South Africa when Gino Wensel went out to exercise his dog, Duke. However, the 40-year-old man noticed a thug approaching towards him with a knife in his hand. On seeing the robber coming towards them, Duke immediately rose to the occasion by growling at him. In order to stop Duke, the robber stabbed the sharp knife in his head with full force. But that wasn’t enough to stop the valiant dog from protecting his owner. Duke continued barking and scared off the robber before collapsing in a pool of blood. Initially, Mr. Wensel thought that he had lost his dog but then noticed the warrior still breathing. 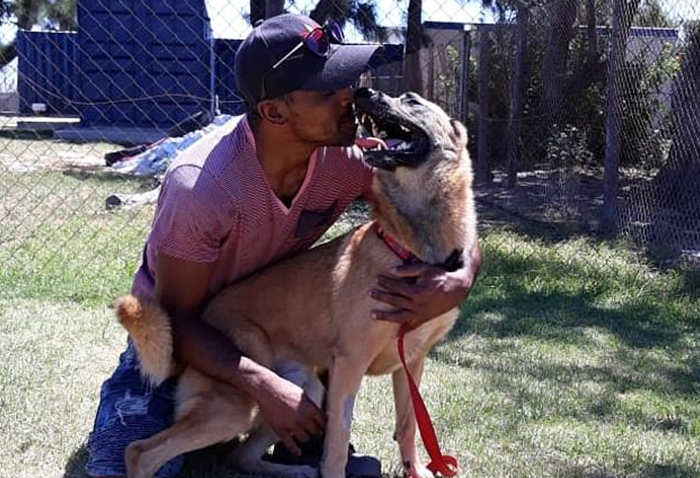 He took the help of his friend and drove him to the Animal Welfare Society of South Africa (AWSSA). 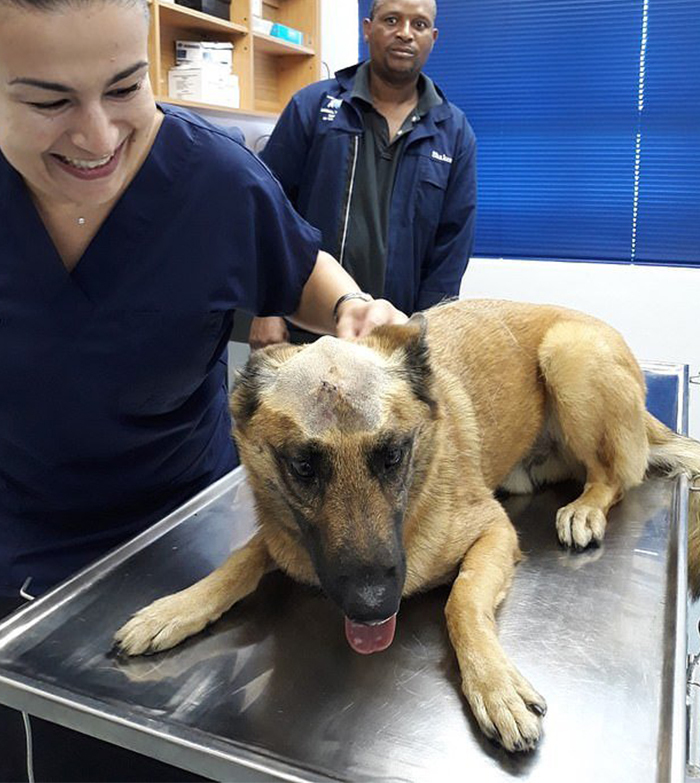 Fortunately for Duke, the blade missed his brain by millimeters and the vet at the clinic was able to bring him back to health. They also didn’t charge Gino for Duke’s treatment because Gino was unemployed and had very little money. They were also blown away by the incredible bond shared by Gino and Duke. Here is a video of Duke reuniting with his master.